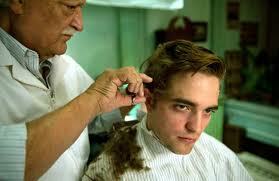 Cosmopolis – David Cronenberg – Cinema – A limousine ride across the streets of New York, enduring anarchists, danger and the monotony of traffic, in order to get a haircut because, well, because Mr. whizz kid unrelenting billionaire R.Patz of the jawline and cadaverous model pallor can. A film almost entirely devoted to dialogue: long scenes in the limo talking in a manner (faithfully transcribed from the Don Delillo novel) that is beyond ‘stagey’. This is a realm of of obtuse, unnatural wit and cold, detached robotic smarm. All of the actors throughout the film, drop in on Eric’s (R.Patz) journey like various prophets in his spiraling odyssey, all coping tremendously well with a very difficult script. Cronenberg reduces background ambience and sound to emphasize the armoured vacuum Eric has created for himself, in the cork-lined sound proofing of his limo, and, more pervasively, in the financially driven quarantine of his calculated existence. Once you manage to acclimatize to the torrential and subhuman verbal dexterity that constitutes interaction, the film gains an increasingly compelling and hypnotic momentum. Robert Pattinson portrays the crumbling capitalist ego with a magnetic central performance that supports the film and, oh so importantly, goes someway to balance the sulking atrocity of Twighlight. The astute and relevant subject matter (a sterile world where money breathes, ‘computer’ sounds antiquated, rapid growth and consumerism invite ghostly suggestions of immortality, data and information are prioritized and encoded virtues, and consequently interaction – as we know it – no longer prevails) is also brilliantly punctured throughout with unexpected wit and moments of real comic delivery (‘my prostate is asymmetrical’ making several inspired appearances).